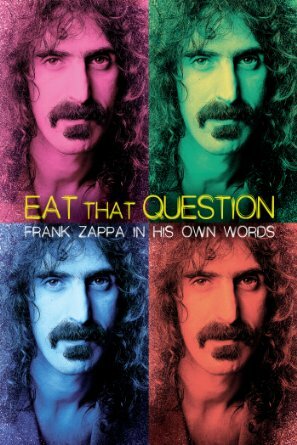 Zappa always veered between being utterly serious and cleverly sarcastic in his pronouncements, so his interviews qualified as a different sort of performance. German filmmaker Thorsten Schutte edits the footage in a chronological fashion, so we see here Frank through the years — from long-haired “freak” who took his music quite seriously, to troublemaker extraordinaire who liked bothering the Powers That Be, to aging rocker who seemed past his expiration date in the era of punk and disco, to a short-haired, well-groomed advocate of free speech, to an éminence grise who became terminally ill at a relatively young age (he died of prostate cancer at 52). Eat That Question thus stands as a compelling portrait of a complicated artist who stuck to his beliefs but who knew how to spice up an interview with a contrarian quote. 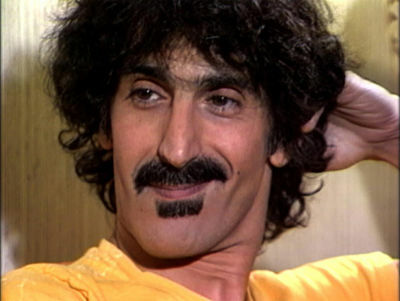 Schutte generally avoids Zappa’s appearances on mainstream American TV, focusing instead on his longer, more in-depth chats on U.K. and European TV, and even local community television here in the U.S. Although we do see him as a young man on The Steve Allen Show, as the mystery guest on What’s My Line and as a contentious talking head on Crossfire, the most interesting American program included in the film is an interview conducted for a 1981 anti-drug video by a Pennsylvania State trooper (who happened to be a major FZ fan). 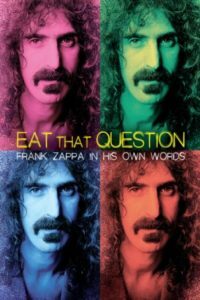 The film offers a small amount of Zappa’s music and is thus not recommended for anyone who is looking for a “101” in that area. It will, however, entertain the hell out of those who are already aware of his music, and those who are looking to listen to an often incendiary modern thinker and performer who happened to write both neoclassical suites and goofy novelty tunes. The film’s release on disc contains no extras. It’s understandable that additional Zappa interview segments were not included because licensing might have been a problem. But it’s surprising that are no interviews with Schutte or Frank’s children Dweezil and Moon Unit, since the trio conducted several promotional chats about the film, some of which can be found online.